William Morris, Lord Nuffield was born in Hallow, Worcestershire on 10 October 1877, but came back to the Oxford area with his parents at the age of about four. He is always regarded as a Cowley lad; but his mother Emily Ann Pether was a girl from Headington, and he too appears to have spent his formative years (from the age of 4 to 14) there. At the time of the 1851 census, when his mother Emily was just six months old, she was living at Wood Farm, which her father Richard Pether leased from Magdalen College. On 7 November 1876, at Holy Trinity Church, Headington Quarry, Emily Ann Pether married Frederick Morris, who originated from Witney but was currently working at Hallow in Worcestershire as a clothier’s assistant. Frederick initially took Emily away from Headington and back to Hallow, where on 10 October 1877 Emily gave birth to their first child, the future Lord Nuffield, whom they named William Richard Morris, presumably after his two grandfathers. By the time of the 1881 census, William Morris had two younger sisters, and the family can be seen living at Spring Cottage, Corner Gardens, Hallow, with Frederick now working as a draper’s clerk. The couple had seven children in all, but only William and his sister Emily survived infancy. Soon after the 1881 census, the family of five came back to Headington seeking support from Emily’s father. Richard Pether (now a widower of 64) now had 370 acres to look after and duly made Frederick Morris his farm bailiff. In the late 1880s Richard Pether also took on the lease of Brasenose Farm from Brasenose College, and ran it jointly with Wood Farm. 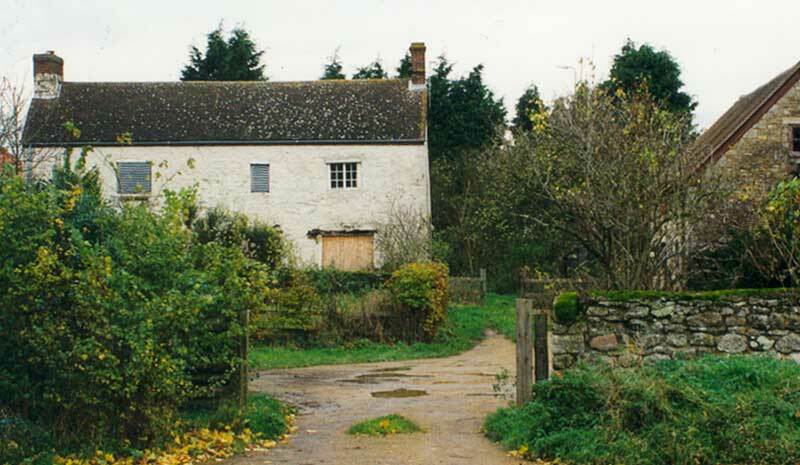 At the time of the 1891 census William Morris (13) was still at Cowley St James School and living with his parents and sisters at “Brasenose Lane” in Headington Quarry, presumably in a cottage near Brasenose Farmhouse (below), which was itself listed as uninhabited in that census. Shortly after the 1891 census William Morris's father had to give up farming because of asthma, and the family moved to 16 James Street in East Oxford. William left school and took a job in a bicycle shop; by 1893 with £4 capital he set up a bicycle business at home; and the rest is history. At the time of the 1901 census William (23), described as a cycle manufacturer and employer, was living at 16 James Street with his father Frederick (53), now described as a cycle agent, his mother Emily (50), and his sisters Alice (22) and Emily (20), who were respectively a milliner and a dressmaker. On 9 April 1903* at St Giles's Church, William Richard Morris married Lizzie Maud Anstey, the daughter of William Jones Anstey and his wife Elizabeth. They were both aged 25: William was described as a cycle engineer, and Lizzie (who was born at Walton Crescent in 1877 and baptised at St Giles's Church on 2 October that year) was living at 8 Woodstock Road at the time of her wedding, and her father was described as a lecturer, although he had formerly been a farrier. They had no children. At the time of the 1911 census William (34), described as a motor garage proprietor and engineer, and Lizzie (34) were living with Lizzie’s nephew and one servant at 280 Iffley Road. Meanwhile William’s parents were now living at 59 Argyle Street in East Oxford, and his father Frederick was described as an accountant: he died in 1916 and his mother Emily Ann in 1934. In Kelly's Directory for 1914/15, William Richard Morris is listed as living at the Manor House in Temple Cowley. 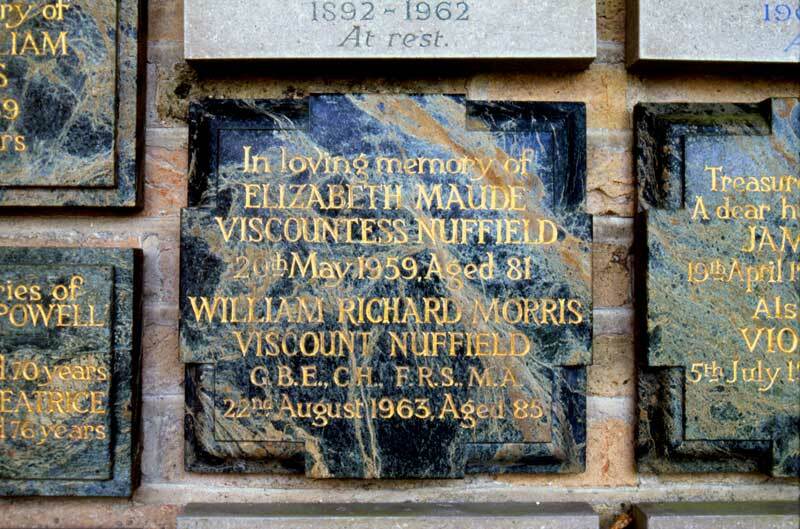 In 1925 William Morris and his wife moved to the village of Nuffield, where lived at a house called Nuffield Place for the rest of their lives. In 1929 he was given a baronetcy, and in 1934 a barony. 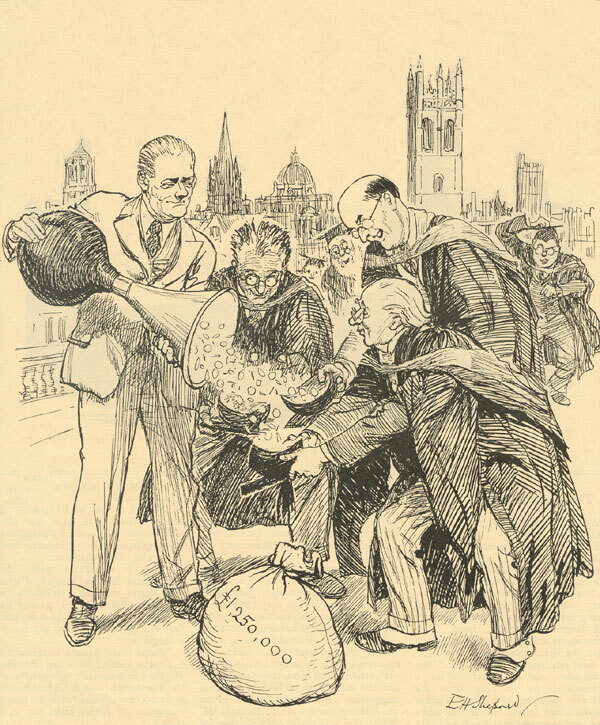 On 4 April 1934 Magdalen College sold to Lord Nuffield the whole of the Wood Farm estate, including Open Magdalen, for £26,000: he now owned the farm where his grandfather Richard Pether had been tenant for so many years. In 1938 he became Viscount Nuffield. His main connection with Headington as an adult relates to the enormous gifts he gave towards medical research and hospitals. One evening in the summer of 1930, the wife of the orthopaedic surgeon Robert Gathorne Girdlestone opened the door of the Red House in Old Road to find an unknown gentleman who introduced himself as “Morris of the car factory” and who gave her a cheque for £1,000 to help keep the Wingfield Hospital in good repair. In 1933 it was rebuilt and renamed the Wingfield-Morris Orthopaedic Hospital, and it was given its present name of the Nuffield Orthopaedic Centre in 1955. Lord Nuffield must have sold Wood Farm to the city council in the early 1950s, as the development of the Wood Farm estate began in 1953. * Many sources give the year of their wedding as 1904, but the St Giles's parish register and the GRO both confirm that it took place in 1903. Nuffield Department of Surgical Sciences. Richard Pether was born in Cowley in 1815 and baptised at St James's Church Cowley on 10 September. He was the son of the carpenter John Pether and his wife Ann. He and his younger brother Henry farmed at Bartlemas Farm, and Richard was described as a butcher of Temple Cowley; but in about 1850 he split from his brother and took on the lease of Wood Farm, which was owned by Magdalen College, thus bringing his family into the recently established parish of Holy Trinity Church, Headington Quarry. Elizabeth Pether (born 26 February 1861 and baptised 9 May at Holy Trinity Church, Headington Quarry); died unmarried aged 82 at Littlemore Asylum on 19 September 1943 and buried at that church four days later. 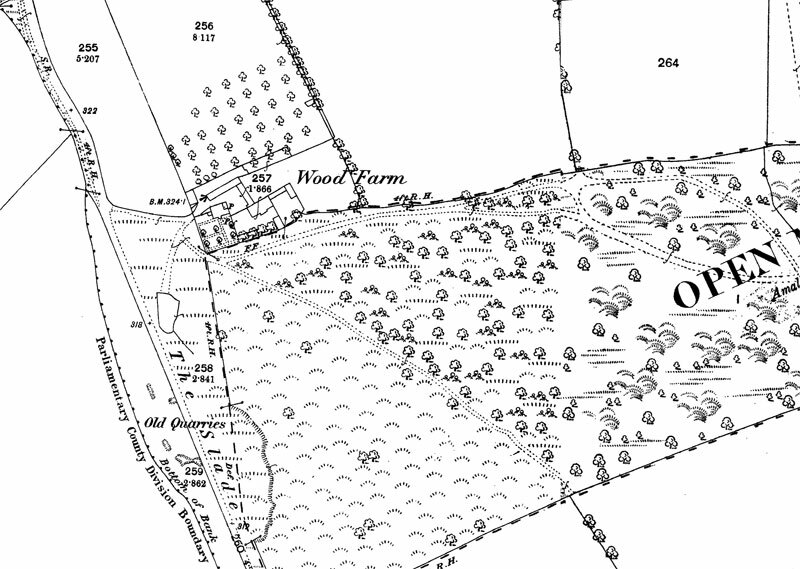 At the time of the 1861 census Richard Pether employed twelve men and eleven boys to look after the 207 acres of Wood Farm; ten years later, his land had increased to 295 acres; and twenty years later to 370 acres, worked by 17 men, three women, and six boys. This growth is probably explained by the fact that Richard, as well as taking on Brasenose Farm in the late 1880s, had, much to the anger of the people of Quarry, encroached on Open Magdalen. With no surviving son to take over the farm, Richard Pether moved away from Wood Farm in 1895, when he was 80, and went to live at Unity House in Larkins Lane, Old Headington with his two unmarried daughters, Annie and Elizabeth (Bessy). He died at the age of 88 on 30 March 1902 (the year his grandson produced his first motorcycle) and was buried with his wife and son Richard in the graveyard of Holy Trinity Church in Headington Quarry. His effects came to £1,746 1s. 4d. The Pether family continued to own Unity House, and Mrs Emily Ann Yockney, Lord Nuffield’s sister, lived there with her family until 1912. The Pether family grave (above) is situated immediately in front of the C. S. Lewis signpost at Holy Trinity Church, Headington Quarry. 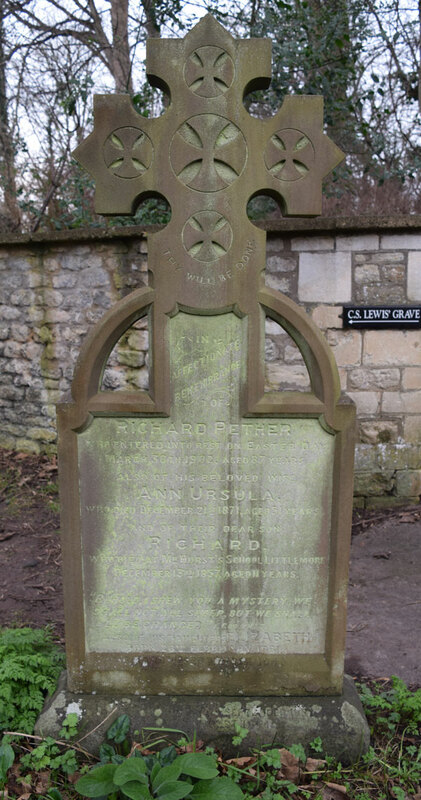 Here lie Lord Nuffield’s grandfather, Richard Pether (died 30 March 1902, aged 87) and his grandmother Ann Ursula (died 21 December 1871, aged 51). Also buried in the grave are three of their children: their son Richard (died 13 December 1867 aged 11, wrongly inscribed 1857); and their two youngest daughters Anne and Elizabeth, who never married but cared for their father Richard in his old age: Anne died in 1943 and Elizabeth in 1944. Next to this grave are three child-sized graves whose inscriptions are now illegible: they must belong to Richard and Ann Pether’s other three boys, who all died before their first birthday in the 1850s: Walter, an earlier Richard, and Henry.